When it comes to holiday music, Diana Ross definitely made up for lost time in the 1990s. The singer hadn’t released any Christmas material at all since 1965’s Merry Christmas with the Supremes — but in 1993-1994, she suddenly had three seasonal projects on store shelves. 1993’s Christmas In Vienna was a live recording of a 1992 holiday concert featuring Ross and world-famous opera tenors Plácido Domingo and José Carreras — the CD and the accompanying television special were both extremely successful. The next year, Diana released A Very Special Season overseas on the EMI label; it was her first solo Christmas CD, and it was well-reviewed by critics and well-liked by fans. For some reason, the project was never released in the United States (a real shame) — but that doesn’t mean her fans at home didn’t get any holiday material that year. Making Spirits Bright was also a 1994 release, a special product sold only in Hallmark stores. Because this recording was only available in Hallmark stores, it flew under the radar for many. However, it was a real treat for fans in that these are all new recordings — meaning there’s no overlap with A Very Special Season. 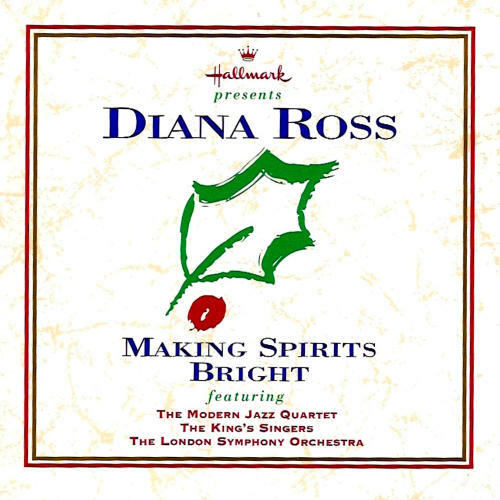 This 12-track CD featured Diana Ross on six songs, one of them an original called “It’s Christmas Time.” Diana is accompanied by the London Symphony Orchestra on all of her songs here except for “It’s Christmas Time” — also featured on this release are the Modern Jazz Quartet and King’s Singers, who round out the other six tracks. Diana, however, is the only singular “name” artist featured, and gets top billing on the project — in fact, her name is printed in even larger type than the title of the CD! Thus, even though this is a Hallmark CD and wasn’t released on Motown or EMI, it still qualifies as a notable and important part of the Ross discography. It’s tough to compare Diana’s 90s holiday albums, as all three are completely different kinds of projects. Again, Christmas In Vienna is a live classical concert, A Very Special Season is a full seasonal-pop CD, and this is a compilation project featuring Diana on half of the songs. And really, the differences are a good thing — rather than working against each other (by being compared by listeners), each disc complements the other. Making Spirits Bright becomes the bridge between the other two, a mix of both classical and pop elements that will appeal to just about anybody who wants to hear some music for the holidays. However, taken purely on its own terms, this is a really fantastic collection of a half-dozen Diana Ross Christmas songs. The inclusion of some surprisingly inventive arrangements and extremely spirited vocal performances make this stand out far more than most Hallmark or other limited-retail holiday collections; there was definite thought and effort put into this, which is why it remains so listenable nearly two decades later. Sleigh Ride/Jingle Bells: Making Spirits Bright opens with a sparkling, jazzy medley of two popular Christmas favorites, mashing them up with an upbeat arrangement led by a superb piano line that dances up and down the scale. The choir of background voices has a decidedly vintage feel; it could have easily been lifted from a holiday classic by Kate Smith. Diana Ross’s performances, meanwhile, it as crisp and clean as freshly fallen snow; no stranger to jazz, she sounds right at home as she croons the opening line, allowing her voice to settle down into the lower notes (“ring-ting-tinglin’ too…”). Meanwhile, much as she did on her jazz and blues concert Stolen Moments, she almost seems to be channeling a horn on some of her higher notes, her voice sounding brassy and tonally thick. The arrangement gets slightly confusing around the 2:40 mark, with Diana delicately singing just two lines from “Jingle Bells” before plunging right back into “Sleigh Ride” — the truncation of the former song almost sounds unplanned. This, however, is no fault of the singer’s; overall, this is a great way to kick off the project, and shows her off in fine voice. In fact, there’s a joy and lightness here missing from some of the songs on A Very Special Season, an album that almost included too many songs tinged with sadness (“Happy Xmas,” “His Eye Is On The Sparrow”) — that lightness makes this an even more welcome listen. The First Noel: This is a song Diana had first recorded way back in the 1960s; titled simply “Noel,” it remained in the vaults and was finally released as a bonus track on the CD reissue of Merry Christmas by The Supremes. It’s interesting to listen to that version and the one recorded for this project back-to-back; both feature similar arrangements and are paced almost exactly the same. Obviously, Diana Ross’s voice sounds much matured on her 1994 recording of the song, but in both cases she sings with a sweet sincerity that really serves the carol well. Listen to the singer starting at 1:06, as she interprets the line, “And they offered them with deep reverence…their gold and myrrh and frankincense…” — she sounds absolutely glorious here, becoming a wise storyteller by keeping her performance unadorned and thus the focus on the lyrics. There a real effortless quality to her work on this song — even moreso than on her 1960s version, which was almost a little too sweet and came off a little forced. At this point, as a seasoned performer, Diana Ross clearly understood the power inherent in a song like this, and graciously allowed herself to become the vessel to convey the meaningful words. It’s Christmas Time: The CD’s sole original tune was written by Diana’s friend and pastor Wintley Phipps, who actually sang at her wedding to Arne Naess and also wrote her 1987 single “Tell Me Again” from Red Hot Rhythm & Blues (and, during a concert I attended in Florida during her I Love You tour, joined Miss Ross onstage for an impromptu rendition of “Amazing Grace” which was, indeed, amazing). This song really isn’t that unlike “Tell Me Again,” other than the fact that instead of a love song, this one is about the spirit of Christmas. Similar to that earlier single, it is a lush ballad with delicate strings as Diana croons the verses, and it erupts into a passionate, memorable chorus that pushes Diana to the upper end of her range. That chorus really is the highlight here; there’s something about the melody and the arrangement that sounds very Philly Soul-circa-1972, as though the song had been meant for The Stylistics (in chord progression, it’s a little reminiscent of the group’s “You Make Me Feel Brand New”). Diana sounds great on the tune; she injects a lot of feeling into the lyrics, caressing certain words and quietly resting on others; she shows a lot of restraint on those verses, allowing the big refrain to take center stage. At 2:32 in, as the song climbs up a key and Diana and the robust choir repeat the chorus for a final time, the entire thing almost sounds like it was lifted from a big Broadway musical; that is the enormous scope reached by this production. “It’s Christmas Time” may not sound like a new seasonal classic in the way that something like Mariah Carey’s “All I Want For Christmas Is You” (released the same year), but it is far, far stronger than many singles released by popular artists around the holidays each year. It’s unfortunately this track wasn’t included on Diana’s A Very Special Season or on another collection that could have gained it more listeners; it deserves to be heard and frequently played during the holidays. Go Tell It On The Mountain: Next, Diana tackles this church favorite, and as it begins, it appears this will be another standard, symphonic arrangement heavy on the strings and classical touches. Right at the top, there’s a violin solo that is breathtakingly beautiful; this is a great addition, but not particularly surprising considering it’s the London Symphony Orchestra playing with Miss Ross. Once the song hits the 1:23 mark, however, things take on a totally different tone; a shuffling percussion line and light piano chords begin to drive the track, and it immediately sounds far more like something she would have recorded for her 1973 Touch Me In The Morning LP than for a contemporary Christmas album. This becomes even more pronounced at 2:13, as a classic Motown bassline fades in, taking the song squarely back to Diana’s roots; these might not be the Funk Brothers playing with her, but someone behind the scenes was definitely listening to some Four Tops when arranging this section. It might be a stretch to call this a truly “soulful” version of “Go Tell It On The Mountain,” but there’s a lot of heart and soul here, not to mention a few gospel flourishes that sound glorious. Diana Ross turns in a stellar vocal here; it’s every bit as good as her turn on the gospel classic “His Eye Is On The Sparrow” (from her A Very Special Season CD), with her high, clear soprano sounding wise and, at times, thick with emotion. What could have been a nice but bland addition to this collection ends up being a real standout thanks to the fact that there was some creativity here, something that really makes it a gift to listeners. O Little Town Of Bethlehem: This is another one Diana had recorded in the 1960s with the Supremes, though it was also left off of Merry Christmas and didn’t surface until many years. Her version here is performed at first almost as a lullaby, with Miss Ross delicately singing the words as though to a group of sleepy children on Christmas Eve. The instrumental track is understated for the most part, as well, especially as Diana sings the first verse and she is accompanied by what sounds like an antique music box. The second verse involves a little more energy, with the instrumentation again utilizing a prominent percussion line and, eventually, the background choir of voices. These touches, as with the previous two tracks, contemporize the piece without making it sound too modern and jarring. Diana’s vocal here is soothing and sweet; she doesn’t stray too far from the song as written, but her clear, bell-like voice certainly injects a warmth here that works beautifully. The end of the song becomes a little overdramatic — the arrangement takes on a theatricality that feels a little forced, but overall this is a nice addition to the proceedings. I Heard The Bells: Diana’s contributions to Making Spirits Bright comes to an end with this satisfying, if perhaps not exciting, version of “I Heard The Bells,” a standard based on the 1863 Henry Wadsworth Longfellow poem “Christmas Bells.” The song isn’t as particularly well-known as some of the others here, which may be why it doesn’t feel as immediately grabbing or memorable. It also happens to be the most classically-arranged of the songs featuring Diana here; aside from “The First Noel,” the Ross tracks here all contain some surprises or unique touches that really make them stand out from versions by other artists. “I Heard The Bells” isn’t unlike something she would have performed on Christmas In Vienna; it’s a very pleasant, strong recording that certainly does the song justice, but it’s not particularly inventive. Diana sounds as comfortable with the material as she has on everything else, but the more serious message precludes her from showing much personality or strength in the vocals. The recording is, at least, classy and leaves the listener with a sort of reverence for both the singer and season, which is exactly what it should do. The two best tracks on Making Spirits Bright — “It’s Christmas Time” and “Go Tell It On The Mountain” — are, on their own, just as good as the best tracks on either of Diana’s other solo Christmas offerings; had they been included on Diana’s A Very Special Season in place of the two weakest tracks there, that holiday album would have been a far better and more consistent effort (they’re definitely WAY better than her “Ave Maria”). Despite the fact that Diana’s voice graces only half of the tracks here, she is so good that she really does emerge as the star, easily earning her top billing. Though this isn’t the easiest collection to come by anymore, it’s well-worth the hunt. This entry was posted in Album Appearance and tagged Making Spirits Bright (1994). Bookmark the permalink. This album is truly MAGICAL! It has become one of my favourite Christmas albums of all time. The performances of all the artists involved are of the highest quality and create a perfect, sophisticated and traditional Christmas blend. The quality of sound recording/engineering is sublime- creating an ethereal quality. Diana’s performances are angelic, I would argue they are among the best of her entire career- she has never sounded better than she does here. The arrangements and song selections fit perfectly like a glove. This album deserves to be heard more widely during every festiive season. 5/5 for the entire project.